One of the first steps in diagnosing mesothelioma is to conduct imaging tests using X-ray, MRI, CT, or PET scans. Imaging scans are the least invasive diagnostic method available. Imaging tests alone are never enough to confirm a mesothelioma diagnosis. Imaging tests provide an important look at any tumors, spreading and possible staging. These tests may work best in combination, as they have their own advantages and limits. A critical step in arriving at a mesothelioma diagnosis is to get a view of what is happening inside the body. Physicians have a number of imaging tests at their disposal to investigate the various symptoms and physical conditions caused by the disease. These tests may be as simple as a chest X-ray or as sophisticated as a PET scan. While imaging tests cannot definitively provide a mesothelioma diagnosis on their own, the information provided by imaging technology is essential for aiding in diagnosis, staging the disease, providing treatment options and helping inform mesothelioma treatment decisions. The result is a two-dimensional image of the contents of the chest. Can A Chest X-Ray Show Mesothelioma? A chest X-ray can help guide physicians towards a mesothelioma diagnosis, but cannot definitively diagnose a patient. 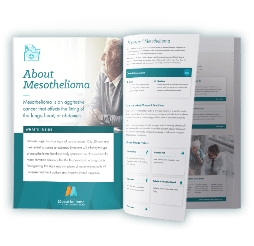 They can be helpful for detecting any abnormalities, especially for those at high risk for developing mesothelioma, such as patients that have smoked or had significant asbestos exposure in the past. In many cases, chest X-rays are helpful for mesothelioma surveillance, but even in ideal circumstances can only provide limited information. X-ray images may be helpful for detecting mesothelioma symptoms, such as pleural effusion (excess fluid around the lungs). However, this common symptom of mesothelioma could also indicate other abnormalities in the lung or the pleura. Therefore, X-rays are often only the first step in diagnosis, and additional tests are needed to confirm the presence of mesothelioma. A CT scan, otherwise known as a computerized or computed tomography scan, requires the patient to lie on a small bench, which is moved through a doughnut-shaped imaging device. This device takes a series of X-ray images called “slices.” Each slice is a horizontal X-ray image of the entire body. The computer connected to the CT scanner will then stack the image slices to provide a three-dimensional (3D), reconstructed image of the patient’s body. Sometimes, patients will be given a certain type of dye, called a radiopaque dye, such as barium or iodine to help enhance the resulting images. These radiopaque dyes may be ingested or injected into a vein, depending on the area that is being focused on by the scan. The 3D image obtained from a CT scan provides a far more detailed view of a person’s internal anatomy than a simple, two-dimensional X-ray image. Indeed, a CT scan is more than 90% sensitive for detecting malignant pleural (lung) mesothelioma. Although it is less effective at detecting peritoneal (abdomen) mesothelioma, CT scans are still the most useful imaging study for diagnosing peritoneal mesothelioma. An MRI scan, also known as magnetic resonance imaging, is similar to a CT scan in that a person is enclosed within a large, circular device while lying down. However, instead of using X-rays, an MRI uses a powerful magnet to create cross-section images of a person’s body. These detailed images can be stacked to form a 3D model of the patient’s internal anatomy. With newer, more powerful magnets, MRI devices can produce anatomical images with incredibly high resolution. Thus, MRIs can provide images of the chest and abdomen that are far more detailed than even a CT scan. Also, because MRIs use magnets instead of X-rays, mesothelioma patients are not exposed to potentially dangerous radiation. An MRI may also be preferred for patients who cannot tolerate certain dyes used during CT scans. However, the major disadvantage of an MRI is that it takes much longer than a CT scan, which can be uncomfortable and cause anxiety. MRIs are also considerably more expensive than CT scans. A PET scan, or positron emission tomography scan, works differently than other imaging techniques. Instead of exposing a patient to X-rays or a strong magnetic field, the energy detected during a PET scan comes an intravenous injection of a radioactive isotope, which is detected by the PET scanner. PET scanners are sensitive enough to detect small increases in metabolic activity, which means they can detect even extremely small collections of cancer cells in remote locations in the body. Typically, the radioactive isotope is embedded within a molecule of glucose (i.e., sugar). Since tumor cells, including mesothelioma cells, are more metabolically active than normal cells, they require more glucose for energy. Tumor cells in the body will take up more of the radioactive glucose and create a stronger signal on the PET scanner. Nuclear medicine specialists can detect the presence of tumors and see if the cancer has invaded or spread to other regions of the body. Detection of metastasis to lymph nodes or distant organs can be a strong influencing factor in staging the cancer. The major limitation of a PET scan is that the resolution of the images it produces is relatively low. Consequently, most modern cancer centers use a dual-imaging approach that combines a PET scan with a CT scan. A dual PET-CT scan provides physicians with a high-resolution 3D image of the patient, along with detailed information about the location of cancer cells throughout the body. Numerous studies have shown that combined PET-CT scans are the most reliable imaging technique for diagnosing and staging pleural mesothelioma. This imaging technology is less valuable for mesothelioma doctors in the diagnosis and staging of peritoneal mesothelioma, but may be helpful in certain cases. 1 Benard F, Sterman D, Smith RJ, et al. Metabolic imaging of malignant pleural mesothelioma with fluorodeoxyglucose positron emission tomography. Chest. September 1998;114(3):713-722. 2 Deraco M, Bartlett D, Kusamura S, et al. Consensus statement on peritoneal mesothelioma. Journal of Surgical Oncology. September 15, 2008;98(4):268-272. doi:10.1002/jso.21055. 3 Mavi A, Basu S, Cermik TF, et al. Potential of Dual Time Point FDG-PET Imaging in Differentiating Malignant from Benign Pleural Disease. Molecular Imaging and Biology. 2009;11(5):369-378. doi:10.1007/s11307-009-0212-5. 4 Miller WT, Gefter WB, Miller WT. Sr. Asbestos-related chest diseases: plain radiographic findings. Seminars in Roentgenology. April 1992;27(2):102-120. 5 Patz EF, Jr., Shaffer K, Piwnica-Worms DR, et al. Malignant pleural mesothelioma: value of CT and MR imaging in predicting resectability. American Journal of Roentgenology. Nov 1992;159(5):961-966. doi:10.2214/ajr.159.5.1414807. 6 Plathow C, Staab A, Schmaehl A, et al. Computed tomography, positron emission tomography, positron emission tomography/computed tomography, and magnetic resonance imaging for staging of limited pleural mesothelioma: initial results. Investigative Radiology. October 2008;43(10):737-744. doi:10.1097/RLI.0b013e3181817b3d. 7 Sorensen JB, Ravn J, Loft A, et al. Preoperative staging of mesothelioma by 18F-fluoro-2-deoxy-D-glucose positron emission tomography/computed tomography fused imaging and mediastinoscopy compared to pathological findings after extrapleural pneumonectomy. European Journal of Cardio-Thoracic Surgery. November 2008;34(5):1090-1096. doi:10.1016/j.ejcts.2008.07.050. 8 Terada T, Tabata C, Tabata RIE, et al. Clinical utility of 18-fluorodeoxyglucose positron emission tomography/computed tomography in malignant pleural mesothelioma. Experimental and Therapeutic Medicine. 2012;4(2):197-200. 9 Wilcox BE, Subramaniam RM, Peller PJ, et al. Utility of integrated computed tomography-positron emission tomography for selection of operable malignant pleural mesothelioma. Clinical Lung Cancer. Jul 2009;10(4):244-248. doi:10.3816/CLC.2009.n.033. 10 Yin WJ, Zheng GQ, Chen YF, et al. CT differentiation of malignant peritoneal mesothelioma and tuberculous peritonitis. La Radiologia Medica. December 11, 2015. doi:10.1007/s11547-015-0609-y. 11 Yu-Fei L, Guo-Qi Z, Yue-Feng C, et al. CT differentiation of diffuse malignant peritoneal mesothelioma and peritoneal carcinomatosis. Journal of Gastroenterology and Hepatology. December 8, 2015. doi:10.1111/jgh.13260.